Is Salt Water Good For Your Hair? What Does Salt Water Do To Your Hair? Does Salt Water Damage Hair? Many of those who travel abroad often ask whether salt water is good for hair, as something so natural and beautiful like the ocean is often interpreted as good for us. Whilst the ocean of course does have its health benefits, unfortunately this does not extend to our hair, and if you are wearing hair extensions this is especially true. Salt water can be very damaging to natural hair and hair extensions, and here we explain why. Sea water is made up of a number of different minerals which include Chlorine 55 | %Sodium 30.6% | Sulphate 7.7% | Magnesium 3.65% | Calcium 1.17% | Potassium 1.13% | Other minerals 0.6%. As salt is a natural dehydrator, and as our hair thrives most when it is hydrated, salt water strips the hair of its precious moisture, resulting in dry, brittle, and difficult to manage hair. Learn How To Revive Hair Extensions In 3 Simple Steps. An all natural intensive conditioners to restore dry brittle hair. Available in 2 sizes, our mini and ultra packs are the perfect holiday accessory. Salt water damages hair by causing dehydration, resulting in dry, broken and tangled hair. Hair that has been exposed to salt water is more difficult to brush, resulting in hair breakage, and hair that is in much need of nourishment. Natural hair can be damaged by salt water, however hair extensions will almost certainly suffer the consequences if worn in the sea. Our natural hair receives sebum from our scalp which is what helps it stay hydrated, soft and shiny. Salt water will wash away sebum, causing the hair to feel dry and be difficult to brush without causing split ends, however in time sebum production will continue as normal and your hair will eventually regain its original texture (although there will be nothing you can do about those split ends other than cut them off). Hair extensions on the other hand are a whole different kettle of fish. Hair extensions do not produce or receive sebum from the scalp, therefore once they are damaged by salt water, they have no way to be able to repair themselves. Learn more about The Importance Of Sebum and Natural Oils. It is for this reason that hair extensions can become severely damaged by seawater, and why whether or not you wear hair extensions or not, you should know how to restore your hair after a swim in the sea. There is no best shampoo for salt water, as it isn’t the salt sitting on the hair that is the problem. The issue is that the salt has removed moisture from the hair, therefore you can use your normal shampoo, but you will need to use an extra intensive natural oil to replace the moisture in the hair, and restore its shine and texture. Natural oils are the perfect fix for salt damaged hair, as they replicate the sebum produced from our scalp. You just need to make sure you are using a natural oil that can penetrate the hair shaft, and that is not full of chemicals and silicones if you want your hair to look and feel healthy once again. 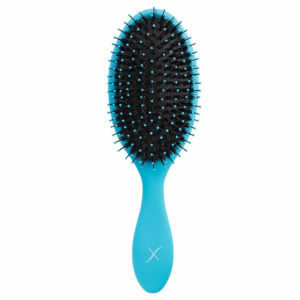 Using a brush that is designed for hair extensions will help prolong the life of them. This is because they are specifically designed to be more gentle on the bonds and your natural hair. Brushing your hair when wet may go against everything you’ve ever learnt about looking after your hair however, when you have hair extensions they must be brushed carefully and thoroughly to avoid matting. Learn How To Brush Your Hair Extensions or How To Dry Your Hair Extensions. Our pre-shampoo treatment is the perfect solution to hair that has been damaged by salt water. Our treatment is all natural, no chemicals, silicones or parabens, and the high quality selection of oils combined in our unique formula work to penetrate beneath the hair’s surface, giving your dehydrated hair the much needed moisture injection it is craving. Suitable for natural hair and hair extensions. Restore smooth, shiny and soft hair with our all natural oil treatment. Is Hairapeutix Safe For My Human Hair Extensions?